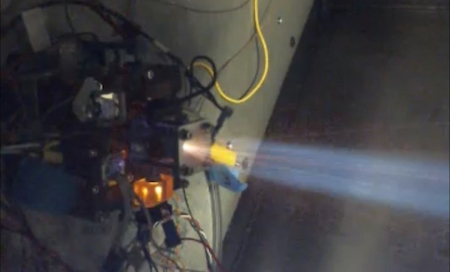 Tethers Unlimited Inc. has won $2.2 million in contracts from NASA and Millennium Space Systems for their mini-thrusters for satellite missions. The company, based in Bothell, Wash., is developing the Hydros as a safe-to-launch propulsion system for CubeSats and other small satellites. The thrusters measure about 4 inches wide. They run on hydrogen and oxygen, which can be produced in space by splitting water molecules (H2O) using solar-powered electrolysis. Hydrogen and oxygen gases are burned in the thrusters to propel satellites during maneuvers. These cool little thrusters are like Murray Leinster's pushpots from his 1953 novel Space Tug, small rocket motors that could be attached to objects and push them into space. They seemed to land by hundreds, but their number was actually in dozens. It was not until the last one was down that Joe could make himself heard. The pushpots were jet motors in frames and metal skin, with built-in jato rocket tubes besides their engines. On the ground they were quite helpless. In the air they were unbelievably clumsy. They were actually balanced and steered by vanes in the blasts of their jets, and they combined the absolute maximum of sheer thrust with the irreducible minimum of flyability.